$37,750. Prices for the larger Santa Fe model, in the GLS version, if you include destination fees begin at $28,350, (add $1,750 for AWD) while the Limited in its most lavish ve4rsion, tops out at about $37,750. The Limited model of the Santa Fe is quite powerful, boasting 294 horsepower and a 3.3 liter, V6 engine. Power, quick, brisk and kick all are adequate adjectives to how this car travels. Very comfortable, agile and smooth ride. The larger model requires a 3.3 liter, 294 horsepower V-6 , as standard equipment. Even so, it moves reasonably briskly, and is as quiet as a tomb as it seemingly floats over bumps and bruises in the road. 21 city and 29 highway. 21/29 miles per gallon fuel economy rating. Hyundai, the company that distinguished itself as the go-to-value-brand in 2008, continues to do so by offering a value-packed Sante Fe now with a third row for a total of seven (7) passengers. The car is spacious and comfortable and of course, has the appearance and feeling of a more expensive brand. Great gas mileage for this hearty, yet very quiet transport. Plush, extremely comfortable, leather seats. Heated, of course. Cabin seating for the first two rows. Innovative with this model is the driving with versatility including the Normal, the Sport, of the Comfort version. Big ole 18" alloy wheels. Front-to-Back Moon roof for extended viewing. Compartments for storage include water resistant bins under the floor and hearty console to store those needed everyday items. Cavernous trunk room showcases 41 cubic feet behind the second row of seats. Rear seating fold flush with just the lift of a latch on the back seats. What a difference a year makes, huh? This new generation of Santa Fe presents itself as a more beautiful, and classier, longer, yet lighter pair of SUVs, one named Santa Fe Sport and the other named just Santa Fe - and it's the larger model that is the subject of this review. The difference between the two? The Santa Fe Sport has two rows of seats that hold five passengers, while the larger, long wheelbase model to be covered by this review and known as the Santa Fe, holds three rows of passengers and is roughly 400 pounds heavier than the Santa Fe Sport model. 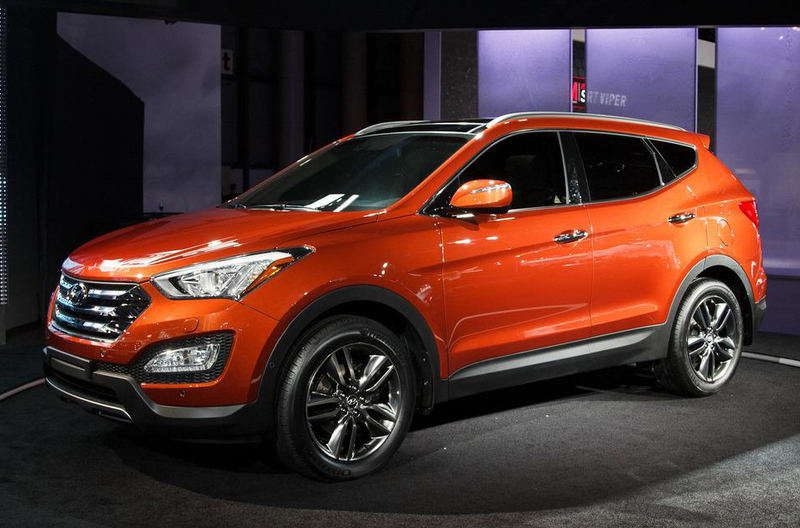 Hyundai says that the Santa Fe Sport and the larger Santa Fe are similar from the B-pillar of the car forward, but the rooflines are slightly different. Where the smaller Sport model has a triangular shaped design as seen from the side profile, the pillars of the roof for the Santa Fe look more traditional and resemble what you see on the Honda C R-V and other crossovers. Driver and Passenger Air Bag. Side and Read Head Air Bags with Side Air Bags, too. Brake Assist, Electronic Stability Control, 4 Wheel Anti-Lock Braking System and Disc Brakes and Traction Control. Hyundai Connected Care for three (3) years - this is worry-free driving for sure. Included is Roadside Assistance, Automatic Collision Notification and Assistance (your 'Lifeline for the Road') and SOS Emergency Assistance. See your Hyundai Dealer for details. The usual bells, bags and whistles. Nothing so dramatically different and new that it bears mentioning. Packed with 'value adds' including the panoramic moon roof, a kick 12 speaker Infinity sound system, Sirius Radio, and a NAV system and rear-camera assist. Touch button on the trunk and the gate automatically shuts. No more reaching and pushing closed; handle enclosed if you want to grab and shut. You can order your Santa Fe either in a well-equipped GLS version or you can get the more tony Limited model, and either one will give you two seats in the third row, but while the Limited gives you the second row captain style chairs, for a total of six seats in the three rows, the GLS has a middle seat in the second row with a 40/20/40 split arrangement for a total of seven seats. Meanwhile, the Limited comes standard with leather and a power liftgate, and it also offers a package that includes a navigation system with 8-inch touchscreen display, a panoramic sunroof and a 12-speaker Infinity audio system. We think as lovely as the Limited model is, the GLS is probably a better value. Of course, you can order any of these with either front wheel drive or four wheel drive. The larger Santa Fe also offers something that's still pretty novel - a steering system that can offer drivers three "flavors," so to speak: you can pick among three settings - Sport, Normal and Comfort - for your steering setup. Just dial it right on up and give it a go! Actually we didn't notice as much difference we would have liked among the modes, but it's still a pretty cool set-up. Attractive and well-thought-out every inch of the way; inside and out. The design's team impeccability show through on the Santa Fe from the front grille, to LED lights, and all angles of this SUV. The third set of windows is a bit of a nuisance but that was the only exterior bugaboo. Inside the dash and the cockpit are spacious, well organized and all control panels touch points are in reach and easy to see. For a larger family or the active family, this is a must see vehicle. The Santa Fe is sleek, elegant, and as we have said, expensive looking. It's just gorgeous. We just couldn't get over how luxurious it was, with top notch interior materials, a beautiful dashboard with simple, easy to understand gauges and controls, and even handy controls along panels in the back of the car so that rear passengers can adjust their environmental conditions as they please. There are some subtle differences, with the larger Santa Fe having a slightly different grille, and a different design and look for the dual exhaust system. Basic: 5 year, 60,000 miles. Drivetrain 10 year, 100,000 miles. Roadside Assistance: 3 years. Rust: 7 years, Unlimited miles. Basic 5 year / 60,000 miles Free Maintenance N/A Drivetrain 10 year / 100,000 miles Roadside 5 year / Unlimited miles Rust 7 year / Unlimited miles.